Vyara town was ruled by Gaekwads of the Princely State of Baroda during 1721 until 1949 when it joined the Indian union, the region also lied under Princely State of Bansda during its reign in 1781 and was acceded to India on 10 June 1948. 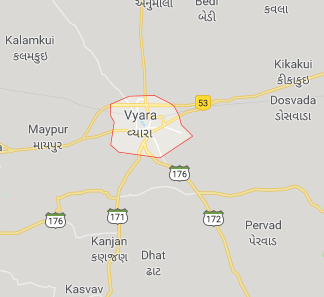 Vyara is also the birthplace of Amarsingh Chaudhry, the ex-Chief Minister of Gujarat State. Tapi District consists of the five Talukas of Songadh, Valod, Vyara, Ucchal, and Nizar Dolvan. Vyara has many attractive natural places to visit across town and in city like Jalvatika Garden, Gaytri mandir, Vyara fort, Mayadevi Waterfall Temple, Padamdugri, Mahal Camp, Gaumukh, Ukai Dam, Unai, Kakrapar Dam, Jankivan and River Front inaugurated in 2018.